Do we only love the land when it is uncomplicated? In the essay titled “Walking,” Henry David Thoreau once wrote, “I believe in the forest, and in the meadow, and in the night in which the corn grows.” The passage, which reads like a creedal statement, reminds me of all the ways in which the land, the sky, and the sea in all their beauty and abundance can bring us back to God in the midst of the civilized madness of consumer capitalism. The forests and meadows that are such nourishing environments are easy to love, which is why I have often sought them out for spiritual nourishment, especially because such nourishment can be hard to find in the official structures of my Roman Catholic tradition. It was for these reasons that a friend and I co-founded Wild Church West Virginia in Wheeling, WV. As we cultivated our sense of ministry and rituals of worship out of doors and at the edges of our tradition, what some wild churches call “re-wilding,” we sought to nurture a spirituality for and with sacrifice zones. We sought to worship on the streets of postindustrial urban environments and near polluted waterways or coalmines. Our practice of re-wilding gave a preferential option for places that are hard to love and where God seemed to be as dead as the landscape. It was in the midst of Good Friday, however, that we discovered ourselves as an Easter People and encountered the God of Life. In my new place in the Delaware River Watershed in Lenni Lenape Territory and in my new position as a Campus Minister at Villanova University, I have been asking how I can invite students and others to re- wild. 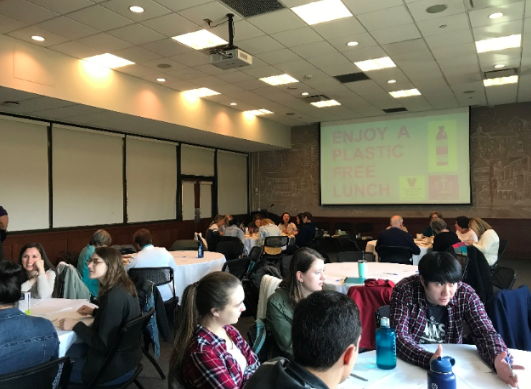 My students inhabit a culture of excess; they are accustomed to disposability in so many ways, so a colleague in the Sustainability department and I collaborated to organize a Plastic Fast for Lent this year. Plastics, the detritus of consumerism, have a similar effect on our landscapes, turning once nourishing habitats into toxic landscapes. We have organized a series of events, prayer experiences, and workshops that invite all of us to, in the words of Sasha Adkins, “reinhabit our garbage-shed.” If our love for the land is to resist sentimentality and cultivate the strength to stand the test of life’s messiness then it must embrace Earth as Earth is found. A true love of the land cannot limit itself to selecting only those parts that are easy to love, but in moments of sickness and death, of beautiful brokenness, do we truly come to know and love our Common Home. In these moments we become a people of resurrection. /// Returning to Thoreau, today our creeds must say “I believe in the Mountain Top Removal Site, I believe in the Pacific Ocean Garbage Patch, I believe in those people, places, and more-than-human beings who have died before their time. And I believe they can live again.” /// As I get to know my new place, I hope to create a new community of worship with others who seek the same. If you are interested in re-wilding together please reach out! Edward Sloane is Coordinator of Service and Justice Experience, (Villanova University Campus Ministry), Board Chair (Catholic Committee of Appalachia), Co-Founder (Wild Church West Virginia).